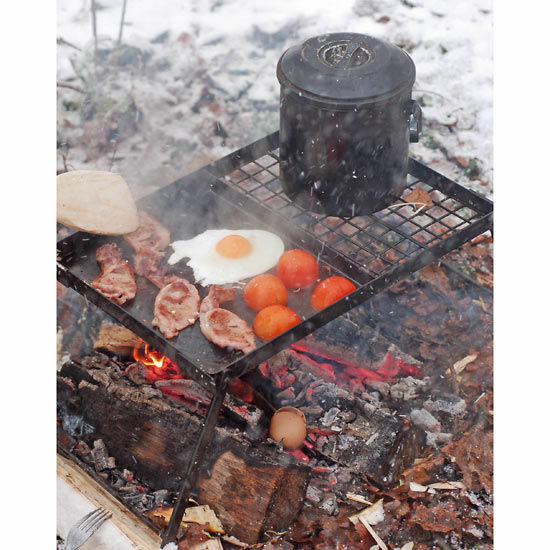 The Ray Mears Folding Griddle, designed by Ray Mears and hand-made by British blacksmith Andrew Kirkham, features a half grill/half plate, making it a versatile piece of kit suitable for grilling, frying and warming. 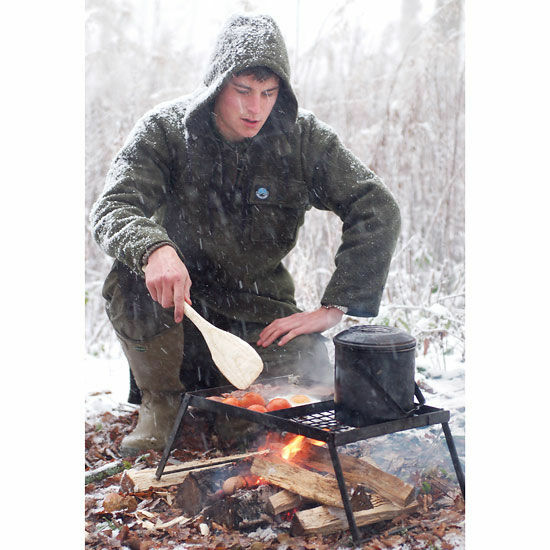 To see Ray Mears and the Woodlore team testing the Griddle out for the first time, please visit the Woodlore Blog. Please note that there has been a slight design modification to this product. The Griddle is now produced minus the metal bar that separates the metal plate and mesh. The Ray Mears Folding Griddle is an extremely tough, fully-collapsible cooking stand, designed specifically for use in the outdoors. The attached legs can be folded flat, making it easy to pack and transport in the back of your car. 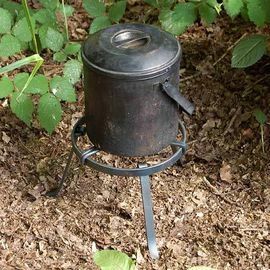 Like all of the steel cooking equipment we sell, this is a piece of kit that will see it through many trips and adventures. The entire griddle is made from self-coloured natural steel; non-treated, it will blacken with use. Each griddle comes complete with a simple-yet-tough, hand-made storage bag, produced in waterproof canvas by Woodlore's in-house leather worker. 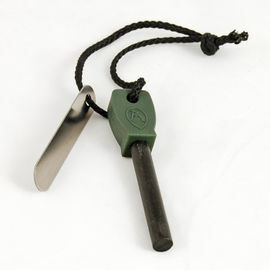 The bag comes adorned with a subtle Ray Mears Bushcraft logo on a sewn-in leather tag. Andrew Kirkham is an esteemed British blacksmith who has produced a number of items for Ray and Woodlore over the years, including our Steel Strikers and Stitching Awls. We are very happy to be working with Andrew on this product and have nothing but praise for his exceptional work. 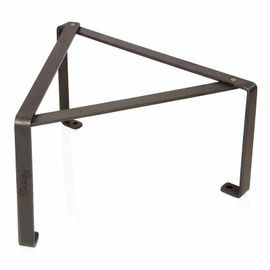 Ray Mears Folding Griddle is rated 5/5 based on 7 customer reviews. An exceptionally well made and a sturdy piece of kit with a useful canvas transit bag. 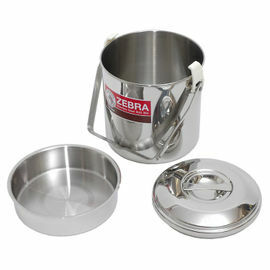 As it says in the description, comes without the bar between the plate and the mesh (not as is shown in the photo); however, without makes it easy to slide food or a pan from one side to the other and of course to clean afterwards. 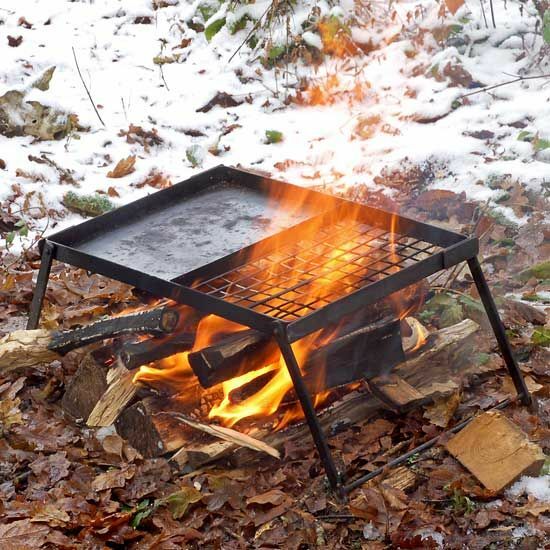 The plate remains flat over the heat of a fire, and it makes a good prep stand off the fire too. If only one piece of cooking kit was allowed as in Desert Island Discs - this is a serious contender. I was over joyed when I opened the packaging. It contains such stunning build quilts and every bit as good as it looks in the picture. As soon as you open this out, you immediately want to set up a fire in the front lounge and grill up some bacon and eggs and get the kettle on, but the wife did stop me there. The protective bag was a bonus but maybe needs finishing along the edge a little better. Excellent piece of kit. Really sturdy and not too heavy. I have yet to use it but I really can't see how I'm going to be disappointed. Looks ideal for a group of 3 or more wanting to cook over a real fire. Very well built and worked very well first time. Excellent kit. Well thought out. 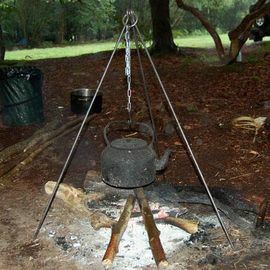 Works; easily supports a dutch oven and has a good size griddle area. Solid and robust; easy to use and pack away; griddle part smooth and very flat; and packs flat into a high quality canvas bag. If you really have to, slips into a bergan nicely without adding too much weight. All good! This is no nonsense, it has no fancy gadgets, strong as an ox, good design gentlemen love it.